Definitions of words, terms, acronyms, abbreviations, and pronunciation guide for esoteric words used in the nascent field of Genetic Genealogy DNA testing to aide traditional genealogical research. Current edition contains 60+ pages of definitions and figures, hundreds of entries. A great resource for beginners in this rapidly evolving new field created by genealogists by using genetics, and in particular DNA testing, to aid their traditional genealogical research. 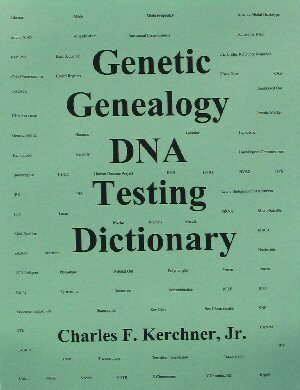 Ideal to use as an extra reference book for deciphering some of the more esoteric terminology used when reading other books in this field or when lurking and reading messages on the Genealogy-DNA-L message board at Rootsweb.com and other online DNA testing discussion forums. C. F. Kerchner & Associates, Inc.